I love writing. This summer I read the best book on how to write, the advice of E.B. 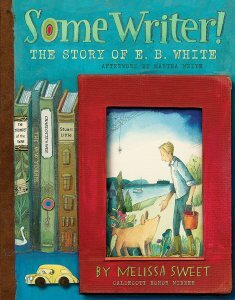 White, author of Charlotte’s Web and other classics. Oh, I have read a host of posts and articles on writing, many from fellow bloggers. They are all filled with terrific advice, but none compare to the simple, direct advice of E.B. White. It all started with reading the new book, Some Writer! The Story of E.B. White by Melissa Sweet. I wanted to learn more about White. After all, Charlotte’s Web is my first chapter reading book of the year in my classroom. Previous Post BLOG TOUR FOR THE STONE ARCH SECRET! Thank you for reblogging, Karen! Wow, thanks so much Karen,. for taking the time to read my About page and your interest. I’m now following you too.